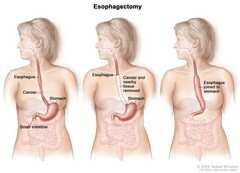 Three-panel drawing showing esophageal cancer surgery; first panel shows area of esophagus with cancer, middle panel shows cancer and nearby tissue removed, last panel shows the stomach pulled up and joined to the remaining esophagus. Esophagectomy. A portion of the esophagus is removed and the stomach is pulled up and joined to the remaining esophagus.